Should Queens Tear Down the 1964 World's Fair Pavilion? 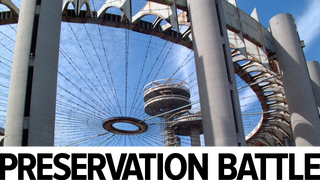 Last month, officials in New York determined that it would cost $53 million to fix and restore the New York State Pavilion, the series of hulking space-age structures built in Flushing Meadows Corona Park during the 1964-65 World's Fair. Should these deteriorating ruins be preserved? In our series Preservation Battle, we look at significant buildings around the world that are threatened and discuss whether or not they should be saved, and how. Today, in the ultimate smackdown to decide the fate of the New York State Pavilion, Gizmodo urbanism editor Alissa Walker says the pavilion should be demolished, while Gizmodo architecture editor Kelsey Campbell-Dollaghan thinks razing it is too short-sighted. I love World's Fair architecture more than anyone—I grew up in St. Louis and treasure the handful of structures that were lovingly saved, restored, and maintained from the 1904 World's Fair. But these architectural follies, like the New York State Pavilion, were not designed to last much longer than the fair's run; even the gorgeous terrazzo map of New York State which covered the pavilion's floor was supposed to be removed and installed indoors. Due to serious neglect, these structures are now an eyesore instead of the gleaming icons of tomorrow they were meant to be. It's admirable that people have tried to save them but the cost is too high to preserve what time and weather have already ravaged. We could talk about saving the pavilion for another use—turning it back into a performance venue as it was used for some time—but that is estimated to cost a total of $72 million. Plus, that's a step in the wrong direction. The pavilion is for teaching people about the awesomeness of the fair, and it's those lost elements of the structure— like the stained glass ceiling, the aforementioned terrazzo floor (that numerous groups have tried to repair for years), and the exhibits themselves—that made the pavilion great. This building was designed for one triumphant use. It might have been preserved if it had been maintained, but now we're left with what's essentially a rotting shell that's no longer contributing to the conversation about our cities or our architecture. The best place to relive the World's Fair is in the adjacent Queens Museum, which has an impressive collection of paraphernalia, including a virtual world and game (above) that introduces students to the fair. That $72 million would be better-spent helping the museum to beef up its collection and create new interactive exhibits; these could help present the fair experience in a compelling way to the next generation and beyond. As much as we want to save a building for the sake of saving it, in this case we can't undo the fact that we were too stupid to save it before it was too late. Let's focus on preserving the important moments of the fair, not a decrepit Philip Johnson-designed circus tent. It's true: Preservation in New York—Jane Jacobs aside—is pretty much an oxymoron. This city prides itself on being irreverent about the past. Raze it, the thinking goes, and let the market have its way with it. Theoretically, every New Yorker benefits—just think of the jobs generated by these future Starbucks locations! But there are several reasons why demolishing this particular aging beauty doesn't make all that much sense. The first deals with the seemingly exorbitant price of maintaining the structure: $43 million, or $72 million to transform it into something new. Do you know how much it would cost to tear it down? $14 million. Which is also not cheap! So maybe we should spend some time thinking about the bigger picture. After all, land values are often bolstered by proximity to cultural and historic attractions. Just look at the High Line: It was a rusting eyesore for decades—now, because the city took a chance on revitalizing it, it's driving a massive development boom in Chelsea. In short, Queens has a lot to gain here, in the long term. Sure, it would be easier to spend $14 million on turning this site into grass. But we could also invest making it a unique cultural hub for a burgeoning borough. Of course, preservation is not a binary. Spending hundreds of millions of dollars to meticulously embalm an aging piece of bombast exactly the way it was built is pretty much indefensible. At the same time, as we've seen with the Domino Sugar Factory debacle, tearing an iconic building down (often just to throw up more anonymous housing stock) just pushes New York further down the road towards becoming a gleaming non-place, a Phoenix or Miami on the Hudson. But there's a middle ground here, too—one where the pavilion is neither destroyed or embalmed, but coaxed into a new role as a dynamic, unique cultural hub. Razing the pavilion isn't a sin—but it's definitely short-sighted. Plus, it's part of Will Smith's historical oeuvre. Maybe he would front us the cash. Who's right? Who's wrong? Got a better idea? Leave it in the comments.